Did Google's A.I. just beat the Turing Test? Yes and no. Did Google’s A.I. just beat the Turing test? Yes and no. The Turing Test is one of the more influential concepts in artificial intelligence; it certainly defined how we think about machine learning achieving ‘artificial intelligence’ in the nascent stages of the field. And Google’s A.I. might just have beat the test with the whole world watching. What is the Turing Test and why does it matter? Alan Turing is the father of modern computing. His early Turing Machine — to many the first general purpose computer invented — cracked the Nazi Enigma cipher, which was one of the turning points in the Allies’ victory in WWII (it certainly turned the tide of the naval battle for the Atlantic). A slightly fictionalized version of this story made some serious Academy Award waves with Benedict Cumberbatch in the titular role of Turing in Imitation Game. It also popularized the Turing Test in pop culture — also termed The Imitation Game, hence the film title — to a point where the greater public has at least an understanding of implications for said test. As described eloquently, if not completely accurately, in the movie, the Turing Test is a benchmark for adjudicating whether or not a machine system can imitate human communication patterns and verbalized thought processes in such a way it could fool a third-party, human observer into believing both participants in the conversation/experiment were humans, or to guess which participant was a machine incorrectly. 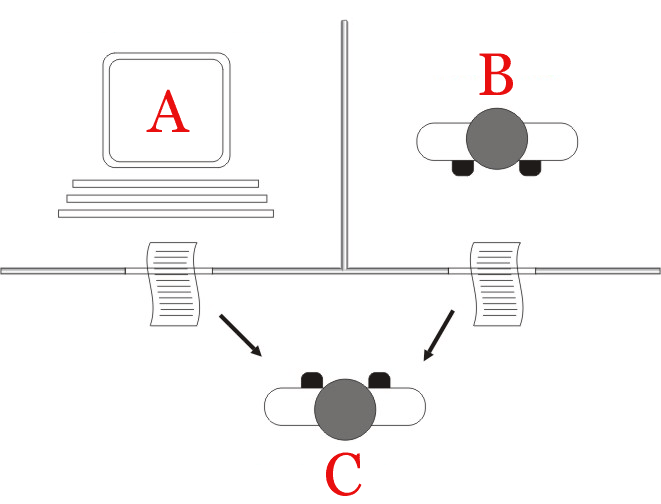 In the diagram, A and B — both humans at the outset — carry on a text-based conversation (so as not to penalize the computer for not being able to accurately mimic human-sounding, vocalized speech). At some point, one of the players is replaced by a computer. Observer C then has to discern if a change has been made, as well as who was changed and which player is now a machine. If Observer C cannot detect the change or identify the machine, then the machine is deemed to have passed the Turing Test. To pass a well-designed Turing test, the machine must use natural language, reason, have knowledge and learn. These represent a huge portion of what we want from true A.I. Natural language processing, improvisation, improvement, learning… these are cornerstones of what A.I. will have to become/master for it to impact our lives the way many companies and futurists predict. And Google may have just done it. Google has been nipping around the edges of this very benchmark for a while now. While not explicitly trying to beat a Turing Test, the pure nature of what Google is working on meant it would come in contact with the benchmark at some point in time either way. On Tuesday, at Google’s 2018 I/O conference, the company treated attendants and the world to an almost unbelievable show: Google’s A.I. called a number of people and businesses on the phone to perform a task (like, say, make a reservation for dinner), and the human on the other end of the line had no discernible clue that the bot s/he was talking to was a machine. You can read more about the live demonstration, as well as hear some of the raw call audio, here. Did Google’s A.I. pass the Turing Test? Well, not exactly. The parameters of the interaction weren’t strictly controlled and the computer didn’t substitute in for a human, which invalidates the standard or classic model of a Turing Test. But perhaps a more important questions is, ‘does that even matter?’. Whether or not Google ‘officially’ conquered the Turing Test is a more academic than practical consideration. The fact that its natural language processing and response rendering is so advanced and seamless is a feat of staggering complexity and brilliance. If the people on the other end of the phone can’t tell, who are we to judge? Google is quick to point out these tests are admittedly limited in scope because the machine was taught how to do one very specific thing quite well. But, it charts out a vision of the brave new future Google and its voice assistant could both enable and empower. Again, what a time to be alive.